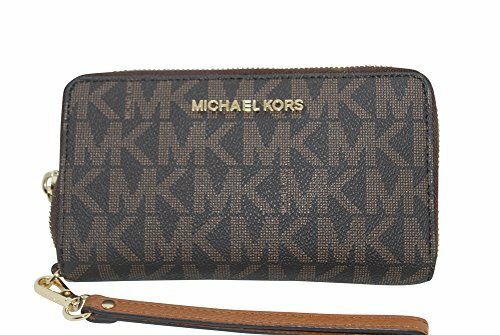 Michael Kors Jet Set Travel Large Flat Multifunction Phone Case Wristlet is crafted in Signature PVC coated twill and finished with polished hardware. This zip around style wristlet is accented with Michael Kors ionic logo on the front. The interior features (6) card slots, a clear ID window, a zippered pocket and a full length bill compartment. There is also a space that will hold most current models of iPhone, Samsung Galaxy and Blackberry phones. It features a removable leather wristlet strap which enables you to carry it as a clutch as well. It measures approximately 6.75 inches (L) x 3.75 inches (H) x 1 inch (W).